Microsoft’s Windows 10 Anniversary Update is arriving soon and along with a raft of new features and deeper Cortana integration. In fact, the virtual assistant is set to replace the standard search function altogether in the upcoming software update, and users will no longer be able to disable Cortana after the Anniversary Update. 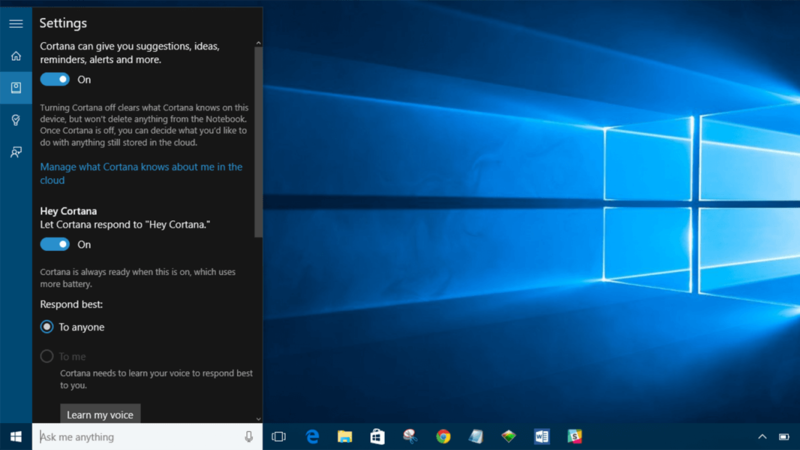 “With the Windows 10 Anniversary Update, the search box is now Cortana," Microsoft said in a statement. "Customers can expect the same great search experience powered by Bing and Microsoft Edge with the added benefit of Cortana’s personality. Currently, Windows 10 users can disable Cortana from within the Settings menu, limiting the search bar to scanning files, folders, and apps. With Cortana enabled you also get web searches, notes, reminders, voice commands and so on. Of course this also requires access to more of your personal information and data. Understandably some users are upset that Microsoft is forcing Cortana on them -- on top of removing Google as an option for web searches and also making the Windows 10 Anniversary Update mandatory. That said, if you really don’t want Cortana for some reason, you can still hide the virtual assistant or limit the information it has access to. According to Microsoft you can opt-out of Cortana’s suite of personalized services, use it to search the web without losing in or hide Cortana and the search box in the taskbar altogether. You can also head to Start> Settings> Privacy> Speech> Inking & Typing and toggle an option called 'Stop getting to know me', which stop it from learning your typing inputs.